OS Grid Reference: TQ 30545 80518. Located at the edge of the Victoria Embankment, overlooking the River Thames, in London WC2, stands the famous landmark known as ‘Cleopatra’s Needle’, which is actually an Egyptian obelisk (column) that dates back nearly 3,500 years. At either side of this 21 metre-high column, two Bronze sphinxes guard the column, but ‘they’ are Victorian replicas. This curious carved obelisk made of Aswan granite was originally set-up at Heliopolis in Egypt by the Pharoah Thuthmose III (1450 B.C.) but, after much wrangling over the cost of having it transported to Britain, it was erected at its present location beside the Thames in 1878, though this was only after an arduous and eventful sea journey from Alexandria. There were originally two of these giant columns but its twin went to America to be erected in New York City. Apparently the obelisk has nothing to do with Queen Cleopatra! There are many panels with hieroglyphs on the obelisk, some dating back to Thuthmose III of the 18th Dynasty (1479-25 BC), but others to Rameses II (1250 B.C.). The monument’s location is just south of Waterloo Bridge and just east of Charing Cross underground Station. It can’t really be missed! From Heliopolis, Egypt, the obelisks were moved to Alexandria and set up in the Caesareum – a temple built by Cleopatra in honour of Mark Antony or Julius Caesar – by the Romans in 12 BC, during the reign of Augustus, but were toppled some time later. This had the fortuitous effect of burying their faces and so preserving most of the hieroglyphs from the effects of weathering, according to Wikipedia. 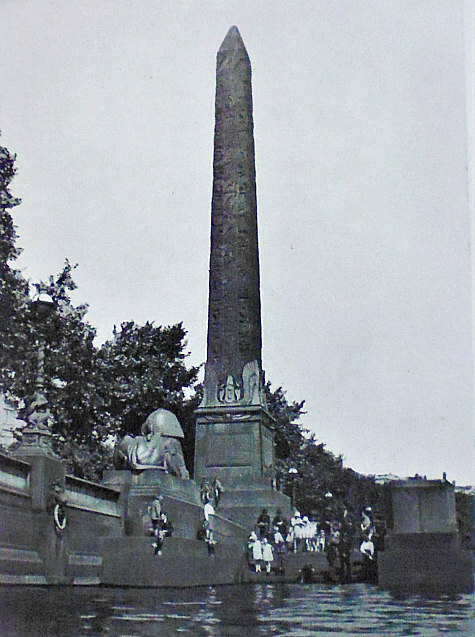 Arthur Mee (1949), says of Cleopatra’s Needle that: “This great column is 35 centuries old. It stands 70 feet high and is 8 feet wide at the bottom and 5 at the top, then ending in a pyramid 7 feet high. It weighs 166 tons, being ten times as heavy as the biggest stone at Stonehenge. “It was first set up about 1450 BC by Thothmes the Third, who introduced war chariots and horses into Egypt’s army, took Nineveh from the tribes of Syria, and laid waste to Mesopotamia. It was floated down the Nile to the sacred city of Heliopolis, the On of the Bible, where Moses was found in the bulrushes. It was taken down by Augustus and sent to Alexandria where it was set up outside Cleopatra’s palace after her death, standing there for 15 centuries. In 1867 the Khedive, wishing it out of the way, offered it to England, and in 1875 Sir Erasmus Wilson gave £10,000 to bring it home. After half a century it was on its way, cased in an iron cylinder 100 feet long and towed by a steam tug. Arthur Mee goes on to say: “Alas for the plans of mice and men, it was wrecked in the Bay of Biscay, and on one side of it as it stands today are the names of six seamen who perished in a bold attempt to succor the crew of the obelisk ship Cleopatra during a storm. In the end it came home and all was well, and under its foundation as it stands by the Thames are buried a Bible and the coins and the papers of the day. The bronze sphinxes are by Vulliamy. The damaged patches at the base are the marks of a German bomb. The hundreds of hieroglyphics on its four sides make up two separate inscriptions, for Cleo-patra’s Needle is a witness to the habit of Rameses the Great of putting his name on other people’s monuments. Thothmes set up his inscriptions in the centre of the four sides, and in 200 years, when Rameses came that way, he set up eight columns of inscriptions of his own on each side of the existing ones. The inscription of Thothmes declares that he has set up two obelisks (the other one stands in New York), capped with gold, as monuments to his divine father Horus the Rising Sun, and on the next two sides he continues to claim his divine origin with due homage to the gods. On the fourth side he makes offerings for a sound life of thirty years. The eight columns added by Rameses express similar homage to the gods, and glorify the rule of Rameses over his country, referring to his chastisement of foreign nations. It is here that we find for the first time known the phrase King of Kings. Mary Fox-Davies (1910 ) tells of the monument in her own friendly style, saying: “You will see this curious column on the Embankment, and wonder perhaps how it came here, and what its history is. It is said to have been one of a pair hewn in Egypt, and erected at Heliopolis near three thousand years ago. Many hundred years later the twin needles were removed to Alexandria, and here they stood until about three hundred years ago. Cleopatra’s Needle was presented to England early in the nineteenth century, but, as you can imagine, much difficulty arose over the question of bringing it the long journey by sea, and it was not removed for many years. Eventually, in 1876, it was enclosed in a huge iron cylinder, which, fitted with sails and rudder, and with a crew of twenty-six men, was taken in tow by a steamer. But in a storm in the Bay of Biscay this queer craft overturned, and was cut adrift from the steamer and abandoned. However, it was found by another vessel, and shortly afterwards brought safely to England and erected on the Embankment. At either side of Cleopatra’s Needle are two beautifully made cast-bronze sphinxes that were erected here in 1878 to guard and protect the obelisk, though they don’t look directly at it. They were designed by the English architect George John Vulliamy (1817-86). He also designed the iron benches and other Egyptian-style statuary, close by. The two ‘slightly smiling’ sphinxes are replicas of the Great Sphinx which stands beside Khufu’s Pyramid at Giza in Egypt; and they each have hieroglyphs saying: “The good god, Thuthmosis III, given Life”. Fox-Davies, Mary, London — Shown To The Children, T. C. & E. C. Jack, Ltd., London & Edinburgh, 1910. Categories: Monument or Obelisk | Tags: Cleopatra's Needle on the Victoria Embankment in London WC2 | Permalink.